DCP (Dry Chemical Powder) extinguishing systems are produced by C.S.I. S.r.l. for stationary ﬁxed systems or mobile systems on trucks. 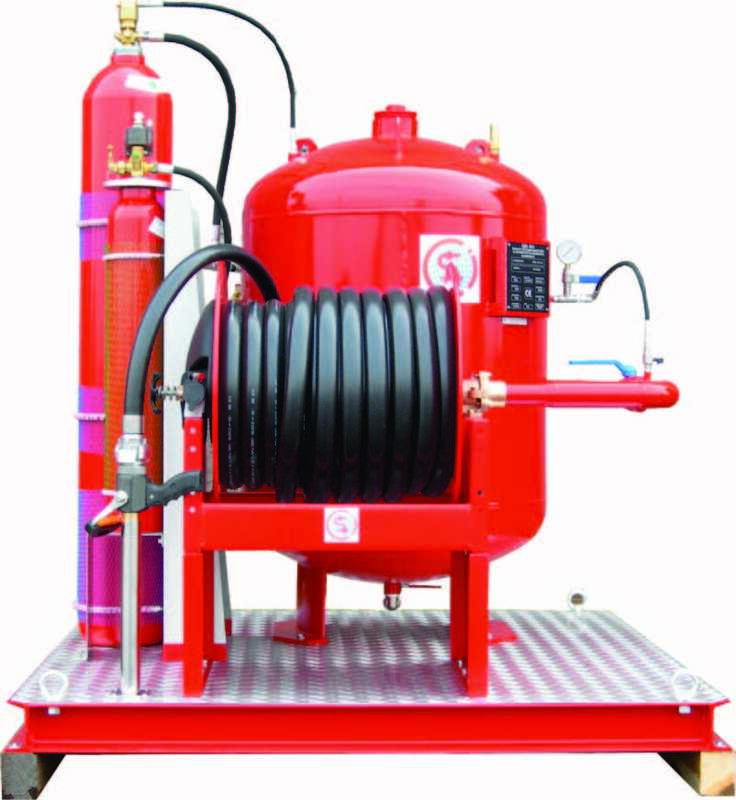 DCP systems may feed ﬁxed piped extinguishing lines, may have hose reels on their skid or, C.S.I. S.r.l. can produce a skid containing DCP unit and auxiliary equipment on the lower side and the upper side a Dry Chemical powder cannon for intervention against ﬁre where powder is the only solution. As a holder of the H1 certiﬁcate (according to PED 97/23 directive), C.S.I. S.r.l. 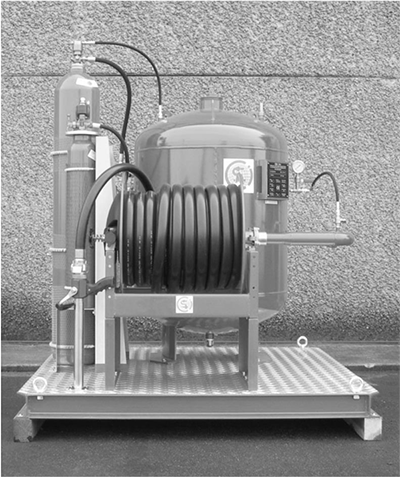 produces pressure vessels of the DCP systems up to 5000 kg capacities. Dry chemical powder systems are produced by several companies on the market with diﬀerent operating principles. The challenge is to discharge the stored quantity of the powder in a predetermined time while leaving no residue in the tank. 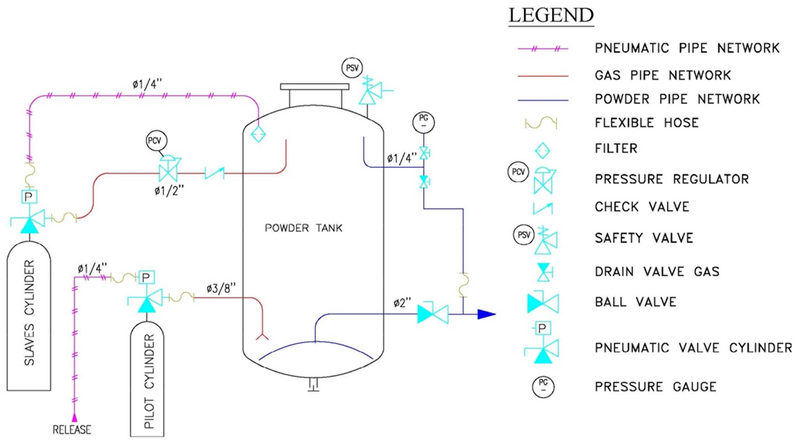 As characteristic behavior of the Chemical powder, when stored in the pressure vessel for a long term, it becomes a non- ﬂuid extinguishing agent. With its special engineering design of DCP systems, designed by C.S.I. S.r.l., precise ﬂow rates are guaranteed by using pneumatically actuated valve/safety valve combinations developed over the years. Pressure vessels are always designed and constructed with necessary previsions made for maintenance and inspection needs. Durante la prima fase, la bombola "PILOT" è attivata: immediatamente crea la pressione all'interno del serbatoio polvere e fluidifica (“si alza”) la polvere in modo efficiente. During the first phase ,the “PILOT” cylinder is activated: immediately it transfers its full stored pressure to the powder inside the tank and fluidifies the powder efficiently. During the second phase the gas pressure inside is then recovered at the top of the tank (at 6 to 7 bars) for actuating pneumatically the SLAVES cylinder valves. Quindi (2 o 3 secondi dopo) bombola di servizio, controllata da un regolatore di pressione brevettato che assicura una pressione di esercizio di 10 bar all'interno del serbatoio. Then (2 or 3 sec later) the slave cylinders pressure is controlled by a single patented pressure regulator which ensures an operating pressure of 10 bars inside the tank. Questa pressione rimane costante per tutta la scarica di polvere ai "proiezione" si intende: con monitor con bocchelli manuali oppure con bocchelli fissi. This pressure will remain constant during the whole discharge of powder at the “Projection” means: monitor or hand nozzles or fixed nozzles. La distanza di proiezione rimane costante: da monitor (30 a 50 m) da ugelli (12 a 18 m): questa distanza è importante perche è la distanza di sicurezza necessaria per operatore. The throw distance will remain constant :monitor ( 30 to 50 m) nozzles (12 to 18 m): this important distance is the safe distance needed by the operator. CO² scarico pressione doppio del volume di gas rispetto a N2; così i volumi della bombola di CO² sono inferiori. CO² pressure release double the volume of gas compared to N2; so CO² cylinder volumes are inferior. Liquid CO2 discharge will be uniform compared to N2 discharge thus preferred by the operator. Guarda P&I in seguito / See P&I hereafter. Come optional (NFPA17 o ANPI) e le opzioni selezionate dal cliente finale, il P&I e la nostra offerta può essere preparata in nostro ufficio di progettazione che ha esperienza decimale. As optional (NFPA17 or ANPI) and options selected by the final user, the P&I and our offer may be adapted by our experienced design department.